Dreary. The saving grace is: the end is in sight! It's only an inch, an inch and half but its finally the home stretch. The socks look (and are) loose on LEGs, but they fit me fine (the back is still much taller than the front, but it rolls (as stocking knit does) making that less evident. These socks have no symmetry, no grace. They are slightly less than a chore to knit. Yesterday, Judy asked: would they have been better in some other yarn—a solid or perhaps a self stripe? I don't know why I don't like it. It's behaved remarkably—It held up to knitting and frogging and knitting and frogging (2 previous starts at socks) and more knitting and frogging (while working this sock) and kept looking good. It's also failed to pool—even the short rows are noticeable lacking puddle blocks of color. I even like the look of the color under the pure white light of my non--Ott brand light. I tend to keep the light by my photo station, and only rarely move it for knitting –but my main knitting seat also has a Ott type (but not Ott brand) white light. But I don't focus the light on my work, but instead use the light for general lighting. But the color, while nice, is not WOW! 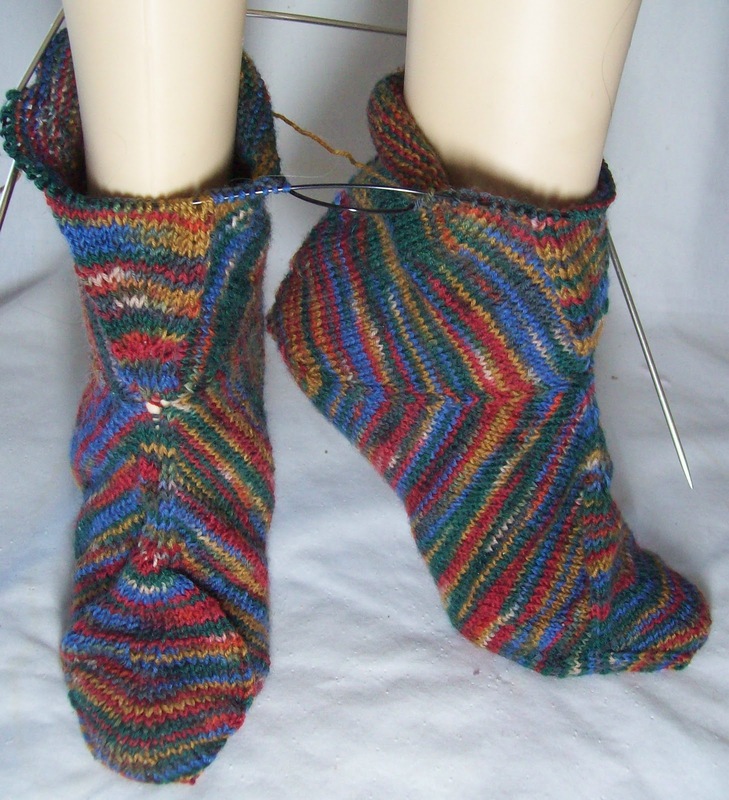 So here they are again—Both socks (now positioned on the needles that allow for both socks to be displayed) with a wedge of short rows growing the center front of the sock faster than the center back. I am still increasing in the center back (as I did on the center bottom of the sole) to keep the bias fabric, but I am working short rows in the wedge—every round! On the first pass I decrease (outside of wedge) and increase (center)--for zero gain/loss, then I work the wedge stitches again, and decrease the out side edge, but don't increase in the center—and created a 2 stitch decrease. When I increase center back, (every 3rd round) I work a full round (no short rows) and work corresponding decreases on the center front wedge. Its not as complicated as it sound—but there are all sort of minor adjustments going on—every round. Including-- repositioning stitches from the back (where the stitch count increases) to the front, where the stitch count decreases. It takes a bit of finessing to do that when working socks 2 at time on 2 circ's!